I’ve heard people say that watching golf on a high-definition television is the closest thing to being there. That may be true for the scenery, but if sheer golf information is what you crave, the iPad might be a better window into the links. The PGA Tour has created a new app specifically for iPad users called PGA Tour HD that will help golf lovers follow players and tournaments more closely. This free app is separate from the existing PGA Tour app, designed for the iPhone and iPod touch. Fans can access real-time tournament updates, including tee times, weather, leaderboard standings and statistics, and individual player scorecards. 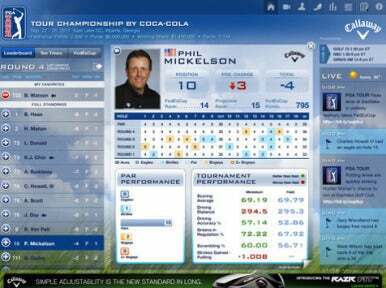 It also incorporates video clips of tournament highlights, close-to-in shots, pivotal holes, and other Tour coverage. Want to learn more about your favorite golfers? The Player Explorer has in-depth information, including interactive maps of player birthplaces. And the play-by-play data takes you even deeper than the scorecard: You get access to distance and placement information for every shot on every hole. It’s a level of granularity not even found on a baseball scorecard. If you’re lucky enough to be able to play a round on one of the tournament courses, or just wish you could, PGA Tour HD has detailed information and stats for each hole at a tournament location. With the help of the course maps, you can probably even replay your favorite golfer’s round in your mind. Whether you’re following along with a tournament on TV or relying only on the app itself, PGA Tour HD helps you immerse yourself in the game. The developer claims that the app is even useful for real PGA Tour pros and, given all the course statistics and other data, that’s not hard to believe. Compared to PGA Tour for the iPhone and iPod touch, the larger screen size of the iPad and new interface design make the app better suited for pouring through all the information available. Despite the sheer volume of information presented, the app is visually appealing and enjoyable to use. PGA Tour HD is free and available now on the App Store for iPads running iOS 4.0 or later. Peter Smith writes about personal technology for ITworld.